Watch us on National Geographic "Filthy Riches" every Wednesday! We now have T-Shirts available for sale - click on the shop link! Witt Hardwoods specializes in buckeye burl, english walnut gunstocks from exhibition grade to standard grade, walnut burl and clusters, slabs for furniture, signs, or whatever you need, as well as, turning blocks for bowls, scales for knives, pistols, or whatever your heart desires. We also design bars, restaurants, wineries, kitchens, and furniture. Quality control and customer service is of the utmost importance, each layout is placed looking for the best grain flow to produce to you the highest quality blank. Bass Pro Shops, Keman Arms, Dakota Arms, and many other major manufacturers and custom gunsmiths are a few companies we have supplied to. We can custom cut any size and dimension for your needs! It is now walnut burl season! 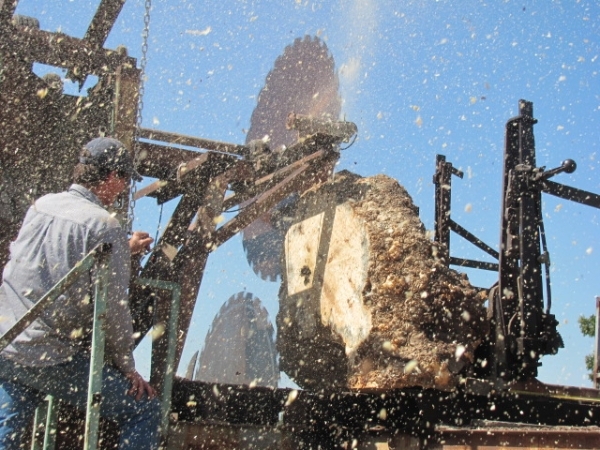 We have huge inventory of California Buckeye burl available!